The Landscape Change Program is an on-line archive of historic landscape imagery. The thousands of images in the archive provide an interdisciplinary look at the past and present of the Vermont landscape. 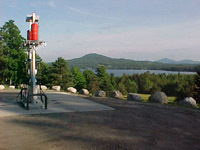 The program is funded by the National Science Foundation to digitally document how the Vermont landscape has changed over time. The landscape of Vermont has changed considerably since it first emerged from the ocean during the collision of tectonic plates hundreds of millions of years ago. For a time, geologically speaking, sediments that became Vermont had been in a warm tropical sea at the equator. Slowly they moved north. Mountains were born and began to erode. In the recent geologic past, massive ice sheets more than a kilometer thick blanketed Vermont. Soon after the glaciers left, Native Americans inhabited the area. Colonial settlers moved in, clearing the land and making way for agriculture, then sheep, then dairy. Thousands of hill farms sprang up and many were later abandoned as fertile, easy to till western soils called. 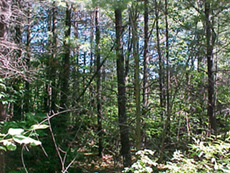 Now the Vermont landscape is mostly forested and increasingly developed. The face of Vermont has changed dramatically over time. The shared appreciation and acknowledgement of this rich landscape history is the goal of this project. What is the Landscape Change Program? We work with townspeople and local historical societies to scan and upload images as well as to add information about existing photos. We work with teachers to develop curricula or integrate our activities and project ideas into existing curricula that focus on the Vermont landscape. We work with students, visiting classrooms to serve as guest lecturers, lead field walks looking for signs of landscape change and serve as resources while looking for information and historic photos. Anyone is welcome to look for and scan historic photos or artwork of their hometown at local historical societies and other sources. Once you have found images, go into the field with one of our GPS units and a digital cameras to retake the photo from the same location. Upload the photo pair and associated location data to our website to become part of our on-line, searchable database of Vermont photos. Or, you can help us learn more about the photos we already have. Either way, the project links people with their communities, their history, and their landscape. Anyone can get involved by searching the photo collection or submitting historic and or recent photos to the database. Townspeople can also help by taking current photos that match historic ones for which we don�t yet have a pair, or by commenting online, adding information about photos that we already have. School classes in Earth Science, Social Studies, Vermont History, American History, Ecology, Architecture, Natural History, Art or Photography can all find relevance in linking with the Landscape Change Program. High schools, middle schools, and colleges across the state have already been involved. We�ll work with any discipline or school that is interested in focusing on changes in the landscapes of Vermont. Teachers, we have curricular and lesson plans for integrating The Landscape Change Program into your units. Check our "learn"pages. You can take our lesson plans and use them or you can involve your class in finding and/or reshooting photos. As funding allows, we are happy to be of assistance in loaning out portable GPS units and visiting classrooms. Search the collection. Look for photos from your hometown or use the keywords keywords to find images that interest you. Help us get our facts straight. Read the descriptions of the photos, check if the date is right and if the photo is assigned to the right town. If not, let us know with our online comment form located just below each photos (hint, it looks like a cartoon character ballon for words). When you comment there, we know exactly which photo you're writing about. Submit Photos. Know anyone who has some old photos? Ask to scan them and use our online submission page to put just a historic photo or paired historic/recent photos into our database. Want to know more? Visit our "learn" pages to see some of our slideshows and other materials. Check out the bibliography or information on Vermont's geologic or settlement history.